Like in the UK sites vary from very small farm type sites to the larger developed ones. We have not had experience of small sites and most of the ones we have visited have swimming pool but not always bars or restaurants. Look out for the Star ratings which means they meet certain standards. Our experience has been that all site owners are friendly, helpful and eager to please. Most speak at least some English, some speak excellent English putting our knowledge of French to shame. Sometimes by being given a map of the site and then report back to the Office (Accuil) with it&apos;s number or position, the pitches in France are generally very generous in size. 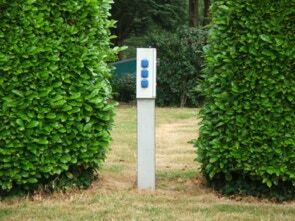 Many sites pitches are separated into small bays by trees, shrubs or hedges which give much welcome shade on hot days and a little privacy. The amenities are always clean and well maintained and some sites have special motorhome service points with water and waste disposal. (pics right) It is unusual to find the old style squat toilets which many British worry about. You may find that some toilet and washing blocks, especially in low season, are unisex. Maybe they find that everyone using the same block economises on heating and lighting rather than having two blocks open. We have never had any problems. Campsites usually have a noise curfew time, around 23.00 hrs to 07.00hrs when noise should be kept to a minimum and cars are barred from entering or leaving the site. Electricity - It is important to check before using electricity on site. The polarity on some sites can be the reverse of what it is in the U.K. and this could lead to sockets becoming live even when disconnected. A device called W4 polarity tester, available from Amazon, will enable you to find out the polarity of the electricity outlet on site. They simply plug into one of the sockets in your unit and, depending on how it lights up, it helps you decided what needs to be done - usually all that needs to be done is to swap over the live and neutral wires in your mains hook-up lead. It is important however to remember to swap these back before using your hook-up in the U.K. (Some people keep a spare hook-up adaptor which is permanently reverse wired for use abroad). 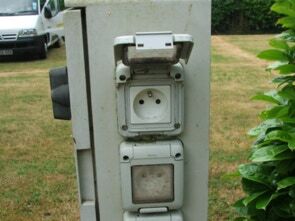 The electric hook-up points are very similar to those you find in the U.K. but can be hidden away in hedges! Most large sites will have British style three pin hook ups but some smaller sites may have the continental two pin hook ups so you will need an continental hook up adapter, available from Amazon. 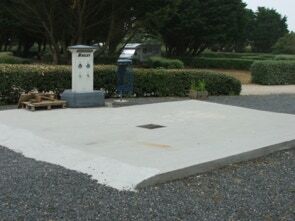 A car park outside the camping area is usually provided for those who wish to go out in the evening and return late, however this is not much use if you are in a Motorhome so be warned or you might find yourself camping in the carpark. "You can’t buy Calor Gas in France"
Gas - You can’t buy Calor gas in France so, you must either take enough for your holiday duration or use Camping Gaz which is readily available at most campsites and garages. Note that your Calor gas regulator may not fit a Camping Gaz cylinder as Gaz cylinders have screw on fittings. Best to check what type you need before you leave - your local camping supplier or gas supplier will be happy to give advice on types of gas and their safe use. Some sites will insist that you leave your passport at reception - this is usually to ensure that you don&apos;t leave without paying - but obviously this can be difficult as you may need your passport to cash travellers cheques etc. 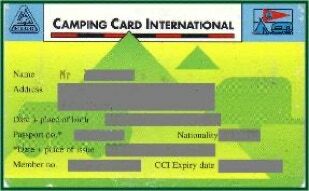 so it is advisable to get a Camping Card International before you leave. CCI is recognised throughout Europe as a guarantee that you have some third party insurance, most sites will accept it as an alternative to your passport. We get ours through the Camping and Caravanning Club of which we are members - 2017 price was £5.50. 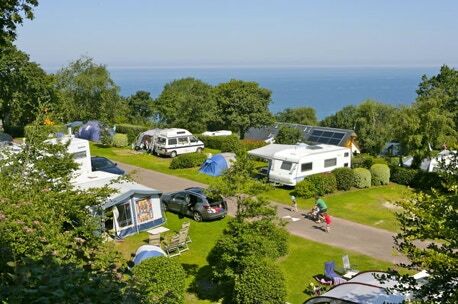 They are also available to members of the Caravan Club, AA 5 Star insurance and the RAC as far as we know. Some travel companies also offer a CCI if you take out their travel insurance so it&apos;s worth asking.